All of our images have a general genre of metadata on them such as exposure, time and date, file name. We can also add our own metadata such as copyright information and add keywords to categorise the image. We would do this before we imported the images to develop. Once you have selected you images to import, you then click into the ”Apply During Import” tab on the right hand side panel. You would the click into ”Develop Settings” and click in ”New” This will open another window on your screen called ”New Metadata Present”. In this panel you can add you name and copyright you image by adding your information inti the box called IPTC Copyright. Once you have done this you click ”Create” in the bottom right corner. Once you have done this you can then add more metadata in the form of keywords. To do this you go into the same panel ”Apply During Import” and go to the box labelled Keyword. 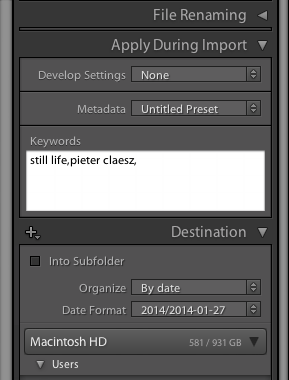 For instance I have added the artists name whom I based my images on, Pieter Claesz and still life, this gives my images a unique name embedded in the metadata. Adding this information being importing your images enables you to copyright your image as well as add more data to enable an easier search of your image should you have vast amount of image files. 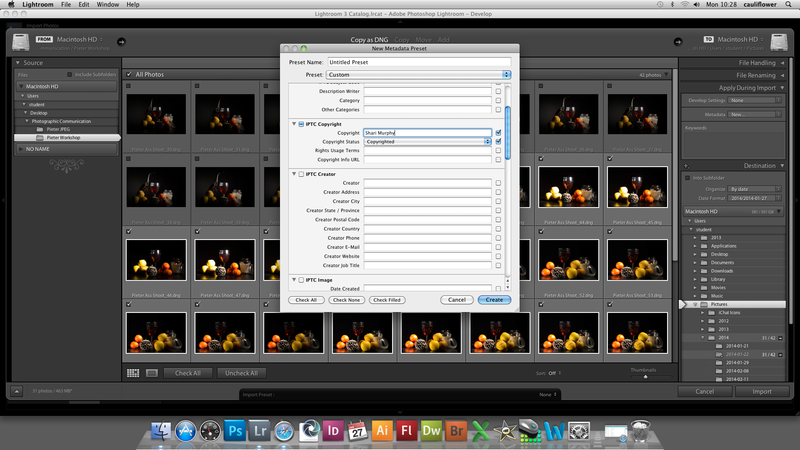 Once you have added your copyright and Keywords you are then ready to import your images to develop. Once you have fully developed your images and you are happy no more post production is required, you will need to click on the PRINT tab in the right hand side of your screen. There you will see on the right hand side under Layout Style 3 options, 1 – Single Images/Contact Sheet, 2 – Picture Package and 3 – Custom Package. 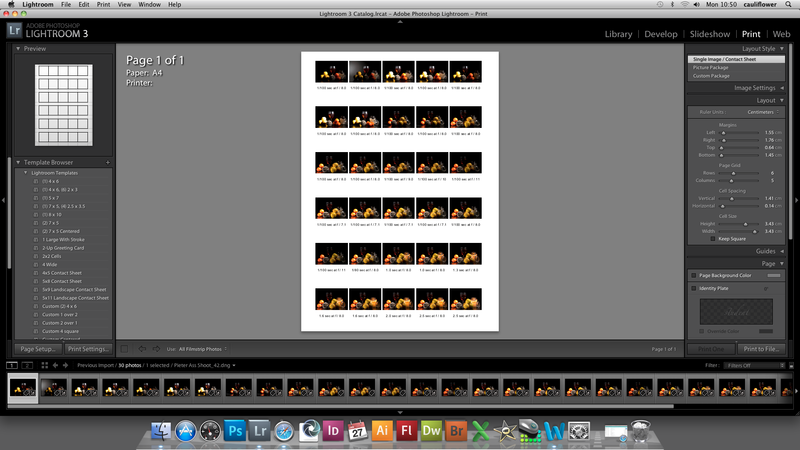 You need to highlight option 1 – Single Images/ Contact Sheet. Once you have selected this option you will need to open the drop down for Layout. 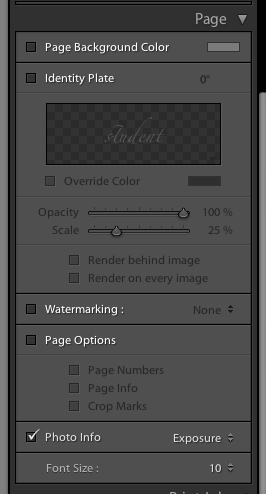 In this panel you will see Margins, Page Grid, Cell Spacing and Cell Size. These are a personal preference as to how you would like your Contact Sheet to look, For Instance you might want your ”thumbnail” to be big, so you would decrease the rows and columns in Page Grid. If you want your ”thumbnails” to be far apart from each other your would reduce the Height & Width in the Cell Size. The Margins are self explanatory this determines your ”Border” size around your contact sheet. .
Once you are happy with the layout of your Contact Sheet, You can then determine what information you would want on your contact sheet. You can do this by opening the drop down box titled Page. In the panel you will see Photo Info, Tick this box. Then to the right of Photo Info you will see, for this instance it says Exposure with 2 little drop down arrows. Open this panel and click on ”Edit” at the bottom of the drop down box. 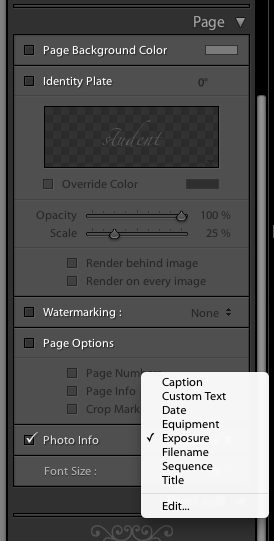 This will then open a separate panel on your screen of options of information you wish to be displayed under your thumbnail on your contact sheet. 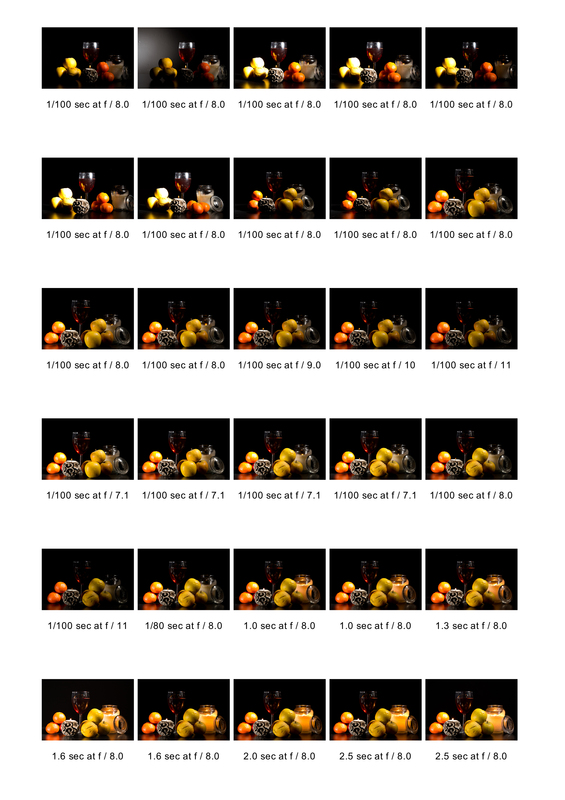 In this Instance I just chose to have the exposure details visible. 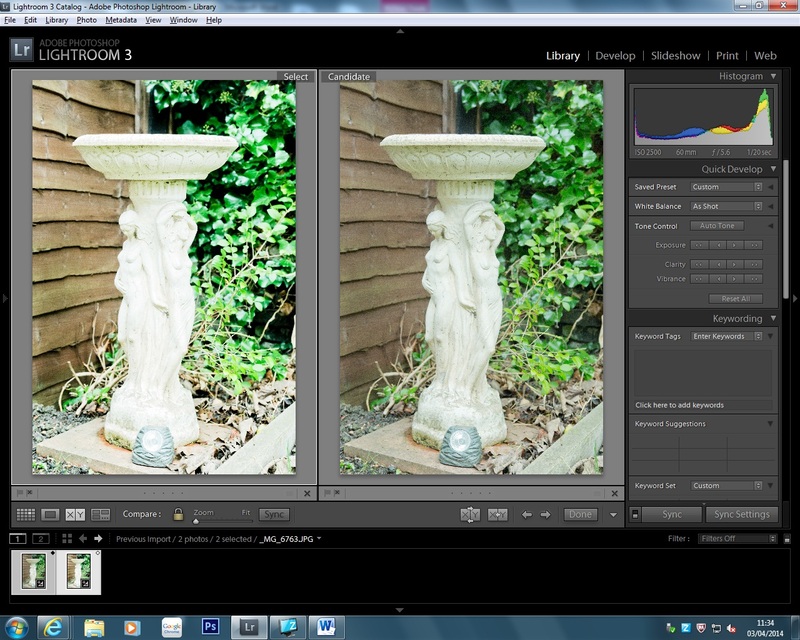 I find this helps as your not having to keep going into Light Room to find the exposure information. You simply click on the tabs titled ”insert” for you required information. Once you have selected the information you require to be on your contact sheet you simply click Done on the bottom right of the open panel. 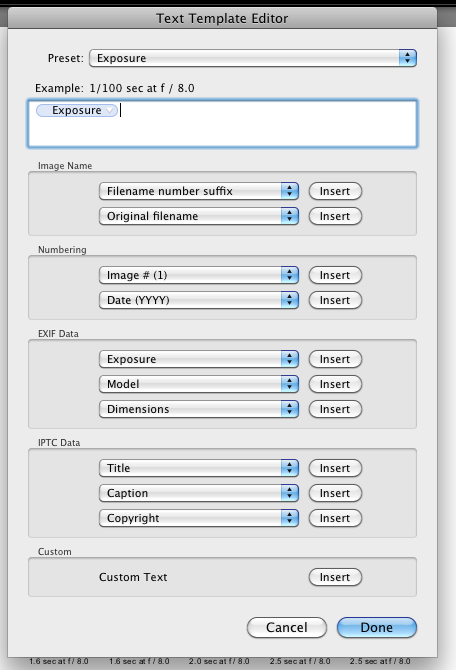 You are then ready to either Export your Contact Sheet or Print to File. Either of these options will save your created Contact Sheet. Hope this as been helpful.